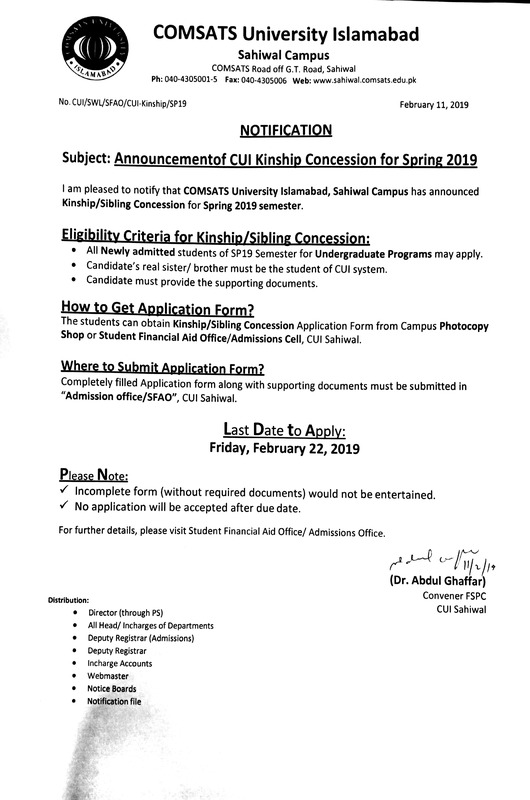 We are pleased to notify that COMSATS University Islamabad, Sahiwal Campus has announced Kinship/ Sibling Concession for Spring 2019 semester. All Newly admitted students of SP19 Semester for undergraduate programs may apply. Candidate’s real sister/ brother must be the student of CUI System. The students can obtain Kinship/ Sibling Concession Application Form from Campus Photocopy Shop or Student Financial Aid Office / Admissions Cell, CUI Sahiwal. Completely filled Application form along with supporting documents must be submitted in Admission Office/SFAO , CUI Sahiwal. Incomplete application (without supporting documents) would not be entertained. In no circumstances application will be accepted after due date.